Set in the heart of Hertfordshire's idyllic countryside, Hanbury Manor is a stunning resort that is both geared towards the golfers among us and for those simply looking for a break in a quintessentially British 5-star hotel. The stunning PGA Championship course was designed by 6-time Open Championship winner Harry Vardon and has played host to the English Open 3 times, as well as currently hosting the European Tour’s Seniors Masters. Located less than an hour outside of London, Hanbury Manor is a favourite for those looking to leave the city for a country escape. The enchanting 5-star manor house offers the highest standards of luxury and comfort, with 2 award-winning restaurants on-site. The state of the art Spa is the perfect place to be pampered after a day one of the finest courses in South East England. The course was originally conceived by Harry Vardon, winner of a record six Open Championships, who designed the holes to fit around the elegant family home in 1890. Since then, Jack Nicklaus Junior was commissioned to reinvigorate the course and make sure that it was relevant to the rigours of the modern professional game. The result is astounding, as the 7,052 layout is now among the country's elite and is a true pleasure to play. 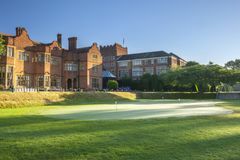 The mature trees and expanses of water that characterise the estate make for a spectacular landscape, helping to explain why Hanbury Manor is regarded as one of the finest destinations for a golf break in all of England, and why the respected Conde Nast travel group named it ‘UK Golf Club of the Year, 2004'. On the tough 8th, be sure to hit the fairway, otherwise your approach to the closely guarded plateau green will be even more difficult, and could end in a watery grave. Hanbury Manor is often described as ‘London's Country Retreat', as its opulent hotel and estate are a mere 25 miles from the city's hub. Within the 200-acre estate, guests will be enchanted by the fragrant walled gardens and the striking Jacobean mansion house, all of which are part of this heavenly 5* resort. The 161 guest bedrooms all offer deluxe accommodation, in either the manor house, orchard wing or the garden court, and are fitted out to offer the best in luxury. The public areas are delightfully elegant, not least the library, whose paneled walls reflect the light from the roaring open fire during the winter months. The hotel's outstanding facilities also make it the ideal choice for your next corporate outing, in addition to being among the region's premier golf break destinations. The Spa at Hanbury Manor reflects the quality throughout the resort, with the best in heath and beauty therapy available including massages, pedicures, manicures, facials, body wraps and scrubs, waxes and plunge pools. In the Club, visitors will find a superb swimming pool, sauna, steam room, spa pool and solarium, while the gym has the latest cardiovascular training equipment, free weights and a number of scheduled classes. The estate also facilities for tennis and croquet. Winning 2 AA Rosettes for international fine dining, the Zodiac Restaurant is spectacularly chic. The Oakes Restaurant serves quality Mediterranean classics in a charming environment. The Oak Hall and Cocktail Bar is the place for a sumptuous afternoon tea, or an aperitif or digestif later in the day. Very spacious room with all facilities needed for a comfortable stay. Staff very helpful and restaurant good. Excellent marshals - off on time. Interesting course with challenging greens! Thoroughly enjoyed our two rounds and would definitely come again - hopefully to improve the scores! !